You are looking at a beautiful, NEW 4 Valve Piccolo Trumpet. This trumpet comes with 2 lead-pipes. The shorter lead-pipe plays the trumpet in the key of BB. Remove this lead pipe and insert the 2nd longer lead pipe, and the trumpet plays in the key of A. 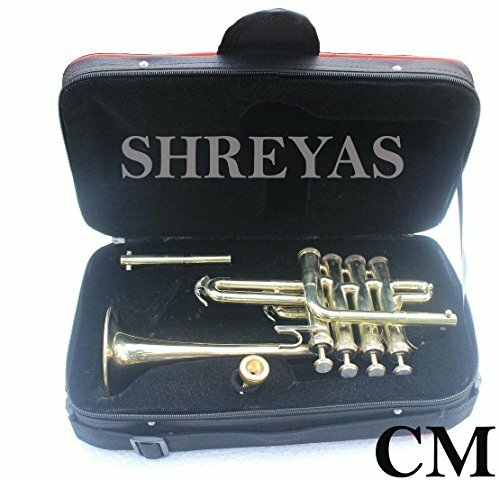 The first three valves serve the same purpose as the three valves of a standard mezzo-soprano trumpet. The fourth valve lowers the pitch a perfect fourth so it is roughly equivalent to the combination of the first and third valves. Playing the piccolo trumpet needs a lot of practice. A mouthpiece is included.